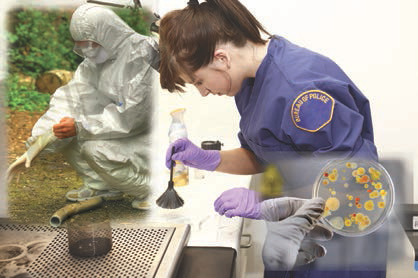 Television shows like CSI and NCIS have made forensics a household name. ECI’s Investigating Forensics program is based on a contextual learning system that is designed to provide an overview of various types of evidence found at crime scenes and letting students learn how to apply scientific principles in the evaluation of this evidence. Students will perform experiments that allow them to apply analysis methods to various types of evidence and determine whether a suspect can be identified or eliminated based upon the data. These studies are representative of the types of analysis typically performed in a forensic laboratory. Experiment 8: Is There Blood? DNA, the genetic material present in every living cell, is very important in modern forensic science. One way in which DNA is used is to generate a DNA fingerprint identification. This identification is a key method in the identification of people and provides a way to solve crimes. Students use polymerase chain reaction thermocyclers and electrophoresis to generate DNA fingerprints. They can then compare the fingerprints they obtain with those from suspected criminals to determine whether they can positively identify the individual from a crime scene.